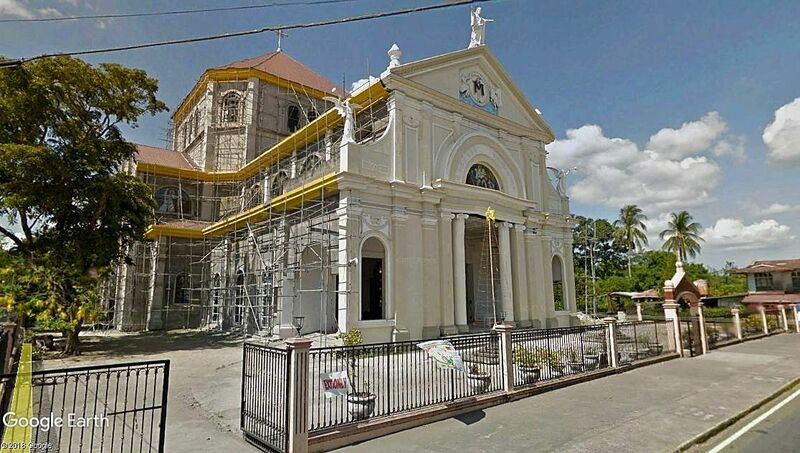 The present-day town of Alitagtag in Batangas used to be part of the older and larger town of Bauan until the year 1910. The previous year, however, a petition earlier filed by several barrios to separate from the mother town of Bauan was formally granted by an Executive Order dated 7 May 1909 and signed by the Governor General James F. Smith. 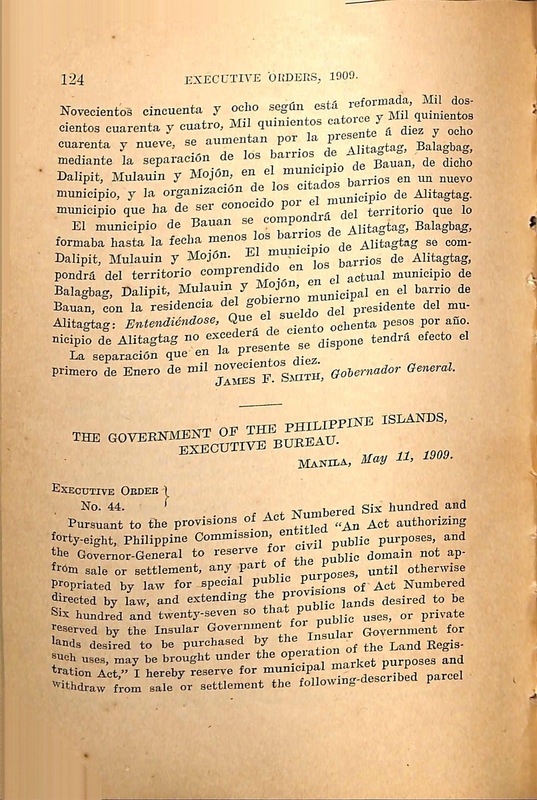 The order went into effect the first day of the following year. 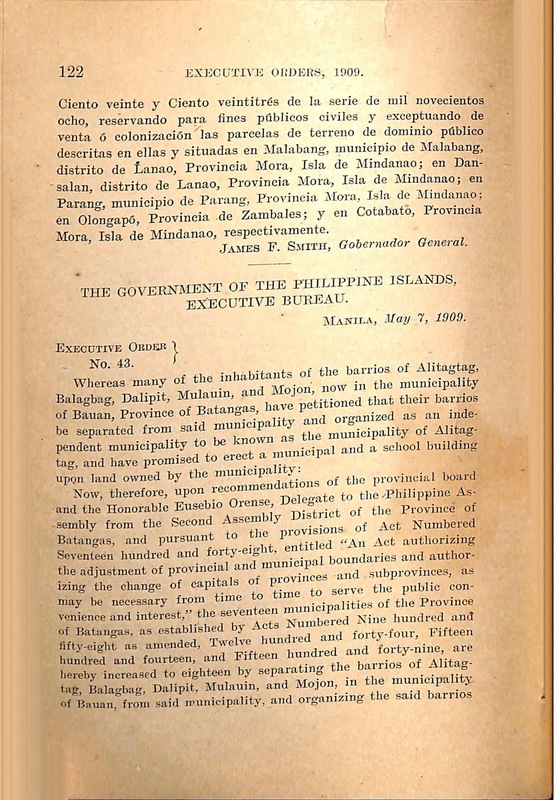 Now, therefore, upon recommendations of the Provincial Board and the Honorable Eusebio Orense, Delegate to the Philippine Assembly from the Second District of the Province of Batangas, and pursuant to the provisions of Act Numbered Seventeen Hundred and Forty-Eight, entitled “An Act Authorizing the adjustment of provincial and municipal boundaries and authorizing the change of capitals of provinces and subprovinces, as may be necessary from time to time to serve the public convenience and interest,” the seventeen municipalities of the Province of Batangas, as established by Acts numbered Nine-hundred and Fifty-Eight as amended, Twelve Hundred and Forty-four, Fifteen Hundred and fourteen, and Fifteen Hundred and forty-nine, are hereby increased to eighteen by separating the barrios of Alitagtag, Balagbag, Dalipit, Mulauin, and Mojon in the Municipality of Bauan, from said municipality, and organizing the said barrios into a new municipality which shall be known as the municipality of Alitagtag. 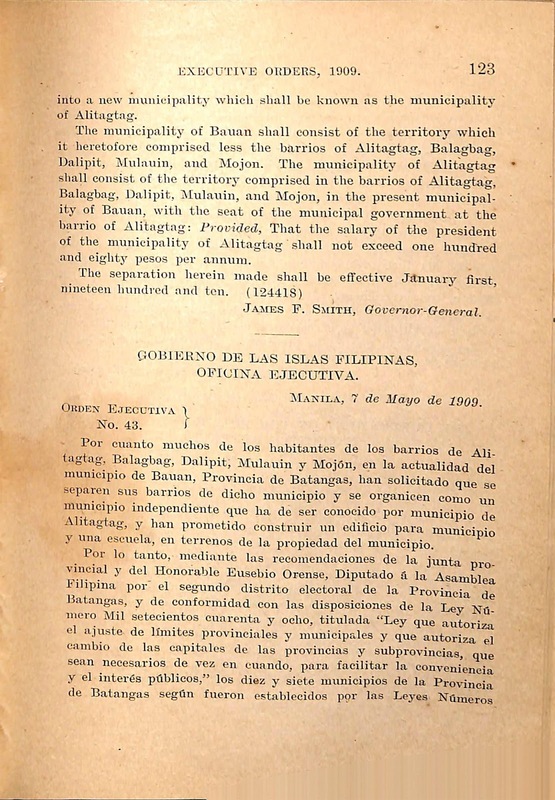 The municipality of Bauan shall consist of the territory which it heretofore comprised less the barrios of Alitagtag, Balagbag, Dalipit, Mulauin, and Mojon. The Municipality of Alitagtag shall consist of the territory comprised in the barrios of Alitagtag, Balagbag, Dalipit, Mulauin and Mojon, in the present municipality of Bauan, with the seat of the municipal government at the barrio of Alitagtag: Provinded, That the salary of the President of the municipality of Alitagtag shall not exceed one hundred and eighty pesos per annum. 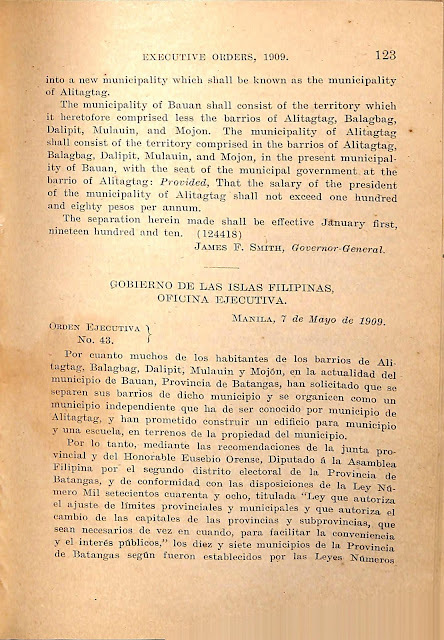 The separation shall be made effective January first nineteen hundred and ten. 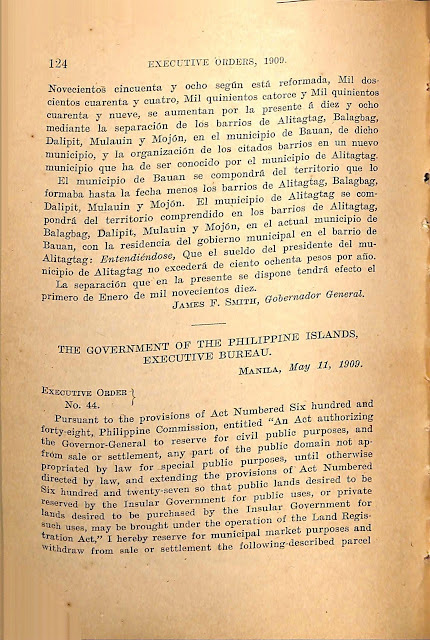 2 Taken from “Executive orders and proclamations issued by Governor-General,” published 1910 by the Bureau of Printing, online at the Internet Archive.